We are no longer bearish on natural gas. We are now starting to buy summer contracts. One technical and three fundamental reasons to buy the dips. In the previous article (dated April 8), we mentioned three reasons why we were still bearish on natural gas. Now, we would like to revisit those arguments and explain why we are now starting to buy summer contracts. On April 4, natural gas prompt month contract has broken below an ascending channel and an ascending wedge near 2.660 mark. It was a bearish move, which indicated that natural gas price could be heading towards 2.600 per MMbtu. Furthermore, there has been an inverse cup and handle pattern in place since at least March 28, calling for even lower prices. 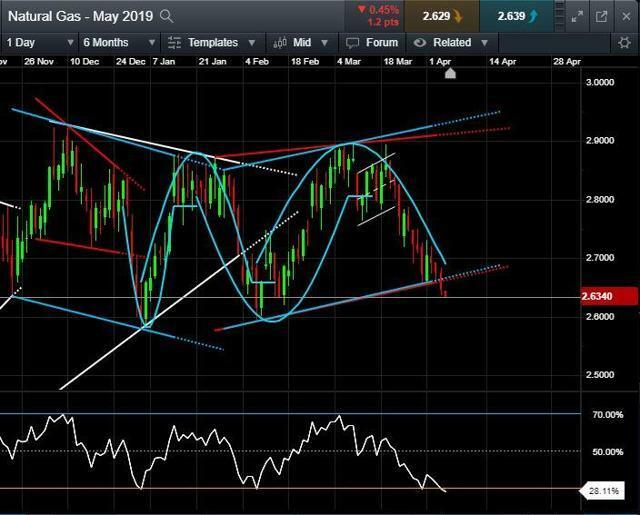 If all of these technical patterns perform according to the textbook, one can expect natural gas price to head towards 2.600, 2.580, and even 2.540. 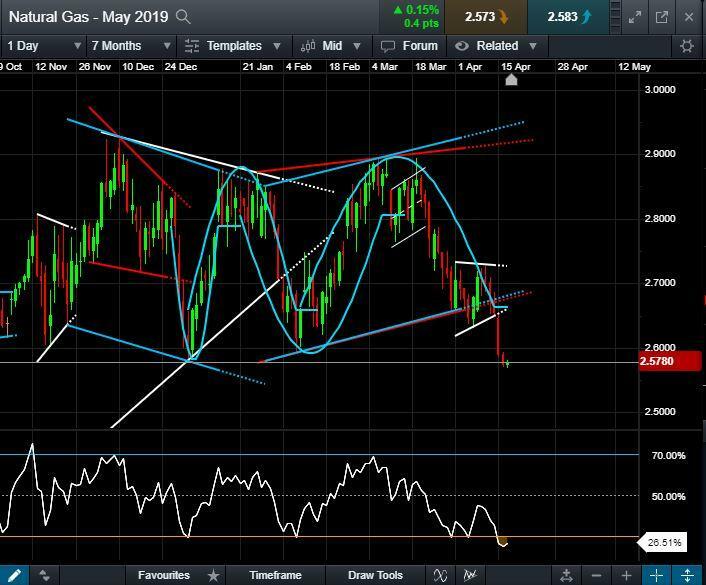 As I am writing this article, natural gas price is already down 1.5% during the day and has reached even the most ambitious targets, so bears should be very happy. May contract price has broken below a symmetrical triangle and could be heading towards 2.610 - target hit. May contract price has broken below an ascending wedge and could be heading towards 2.580 - target hit. May contract price has broken below an ascending channel and could be heading towards 2.540 - target hit. The market is now technically extremely oversold. Estimating future bearish targets is now a purely speculative endeavor, as classical technical patterns no longer provide any clear guidance. 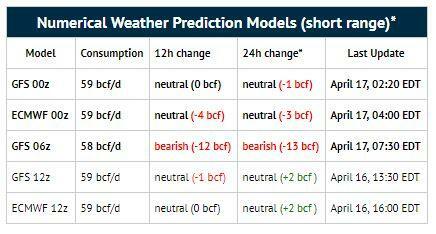 Despite the fact that Wednesday's 06z short-range weather model showed more bearish changes (see the table below), they did not change the bigger picture - consumption and total demand are bottoming out and mostly likely will not get any lower. Here are the reasons why we are leaning towards the long side of the trade. 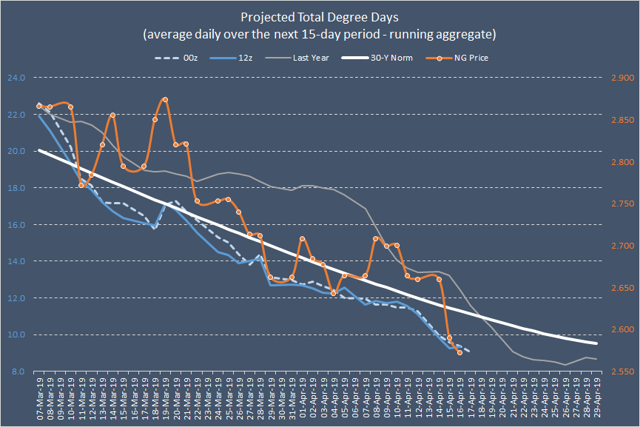 Projected number of total degree-days (TDDs) remains low. But how much lower can it get? As of today, 04:00 EDT, projected TDDs were 21.8% below last year's level and 18.6% below the norm (see the chart below). Previously, we said that as long as TDDs remain below the norm and below 2018 results, we will be looking for opportunities to short the rallies. And indeed, shorting the rallies is still not unreasonable. However, given that the price is near multi-year lows and projected TDDs will begin bottoming out in about 10 days, shorting the rallies is becoming more risky than buying the dips. 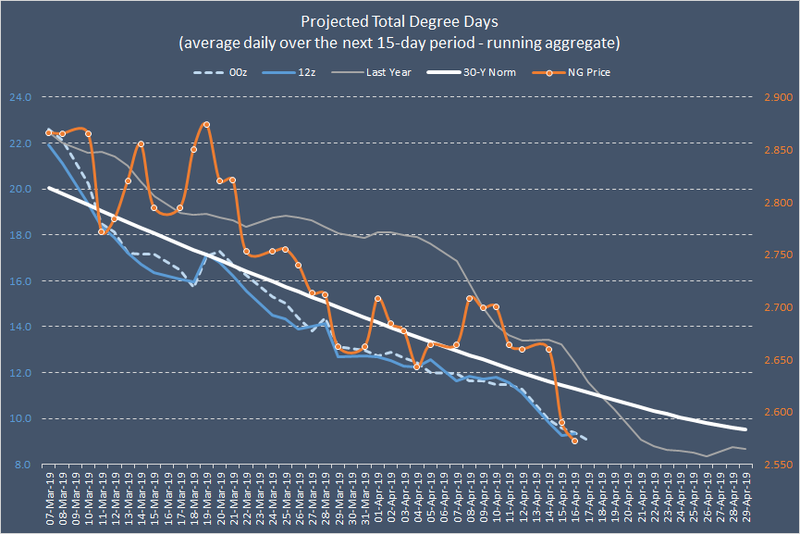 Our analysis shows that total demand will bottom out sooner than TDDs. We estimate that in relative terms, total demand will reach "a trough" on April 21 (see the chart below) and will then begin to grind higher (slowly). 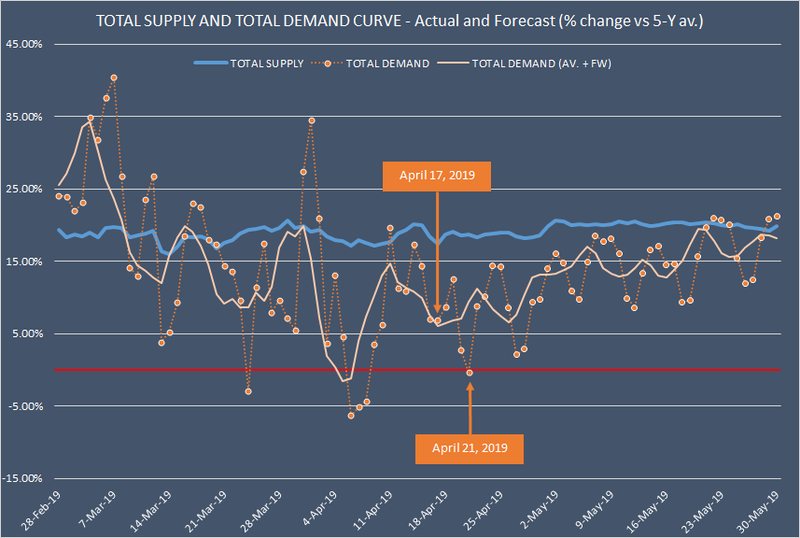 No new "lows" in total demand are anticipated after April 21. Obviously, this is not a precondition for a major rally - especially, given that total demand curve is still projected to remain below a total supply curve - but, it is definitely a precondition for price stabilization. Source: Bluegold Research estimates and calculations; Notes: "Total Demand (av. + fw.)" = 5-day average demand brought forward by five days. Data beyond April 16 is forecast. Total balance is projected to be mostly bearish (vs. 2018) in week 1 - week 5 (Apr. 19 - May 17) - see the table below. However, the price is already below last year's level. In relative terms, the most bearish week is week 1 (Apr. 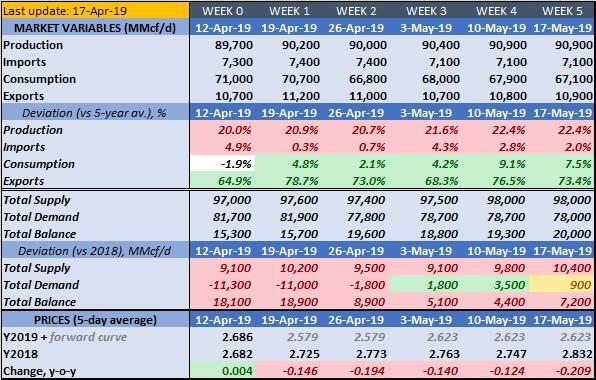 19); the least bearish week is week 4 (May 10). On balance, this table does not look particularly bullish. But does it really look all that bearish when natural gas price is just $2.53 per MMBtu - the lowest it's been for the past 720 trading sessions? Furthermore, market variables have two major bullish risks: 1) dry gas production is likely to be revised lower; 2) exports are likely to be revised higher. Currently, coal-to-gas switching remains strong - 7.1 bcf/d, +1.0 bcf/d vs. 5-year average (see the chart below). 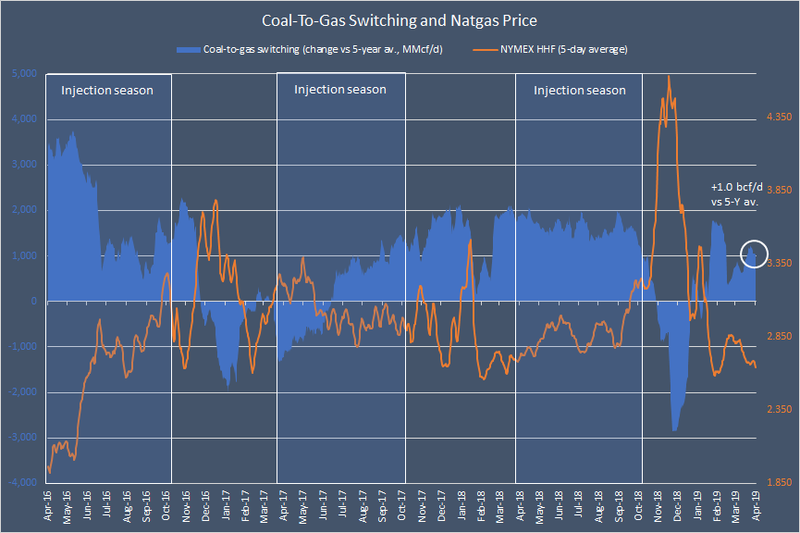 Historically, when coal-to-gas-switching was at least 1 bcf/d above 5-year average during the injection season, natural gas price always remained above $2.500 per MMbtu. On balance, we think that buying the dips is the most reasonable trading strategy right now. We will be buying the dips - especially in the 2.550-2.500 area. However, we do not see any preconditions for strong rallies, and therefore, our targets will be relatively modest. Thank you for reading our weekly report. We also write a daily update of our forecast for key natural gas variables: weather, production, consumption, exports, imports, and storage. Interested in getting this daily update? Sign up for Natural Gas Fundamentals, our Marketplace service, to get the most critical natural gas data.